Investment in advanced technology and a commitment to continuous improvement have helped Millar Western build a record of superior environmental performance at its manufacturing facilities. Our lumber and pulp operations work to minimize their environmental footprint by reducing consumption of energy and other inputs, finding new uses for manufacturing byproducts, and participating in recycling programs. These efforts have netted impressive benefits for our company and our environment — lower costs, reduced carbon emissions, decommissioned wood-waste burners, and avoided use of landfills — and been recognized by Alberta Environment’s EnviroVista program. Millar Western is pursuing a strategy that will see virtually all manufacturing wood waste converted into useful products, eliminating burning, enhancing economic opportunities and ensuring environmentally sound use of forest resources. With a goal of making full, no-waste use of the wood resource, Millar Western has made significant progress in converting wood residuals into useful products, for its benefit as well as that of the environment. 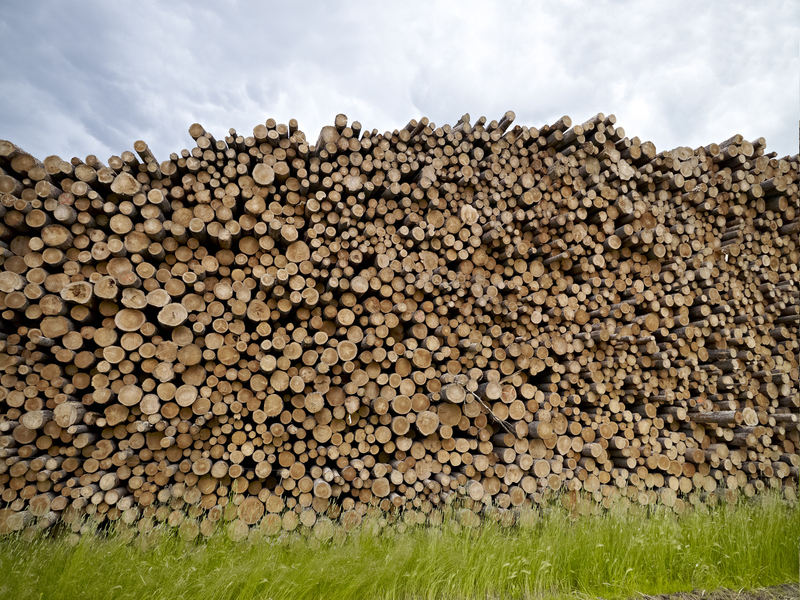 Our sawmills have found uses for all byproducts of the lumber manufacturing process: At Fox Creek, all wood residuals are transferred to a nearby electricity plant to fuel the generation of green energy. At Whitecourt, wood chips are converted to pulp at the company’s own BCTMP mill and at a neighbouring newsprint facility, and wood shavings and other residuals are transferred to a medium density fibreboard (MDF) plant, and remaining wood waste is sent to a power plant for conversion to renewable energy. Our pulp mill applies biomass, a byproduct of its effluent treatment process, to farmland as a soil enhancer, under contract with local agricultural producers. 1. 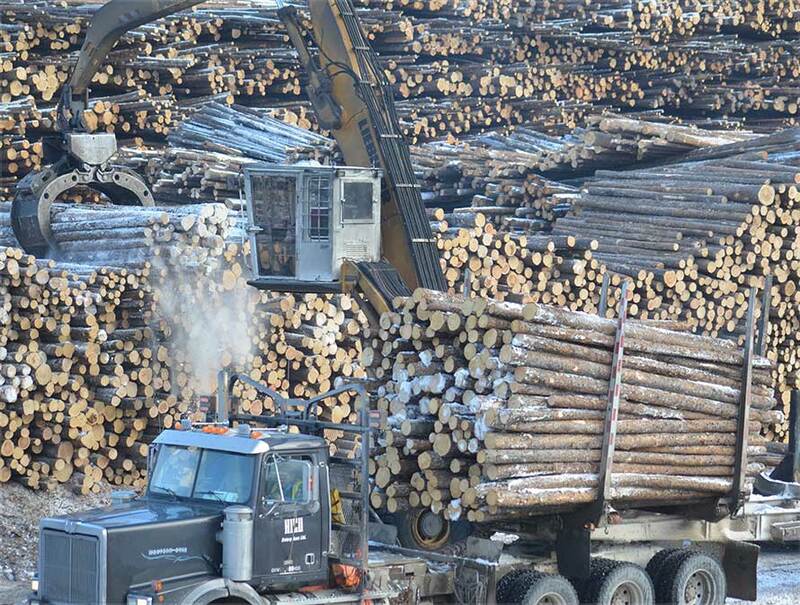 Softwood timber harvested from sustainably managed forests is delivered to our Sawmill, for lumber production. 2. Sawmill residuals in the form of shavings and fines are sent to a regional Panelboard Mill, while bark and sawdust are transported to a regional Bio-electricity Plant, to generate green power for export to the Alberta grid. 3. Softwood chips are conveyed to our Pulp Mill, for pulp production. 4. Hardwood timber harvested from sustainably managed forests is processed into wood chips at the Pulp Mill Woodroom, for pulp production. 5. Bark from the Pulp Mill Woodroom is sent to the regional Bio-electricity Plant. 6. Fines and pins from the Pulp Mill are distributed either to the regional Bio-electricity Plant or to the Oil and Gas Sector for use in site remediation. 7. Sludge, a byproduct of pulp production, is transported to local Farmers’ Fields, for use as a soil enhancer. Reducing consumption of energy and other inputs is good for business and for the environment. Millar Western’s search for ways to minimize usage of electricity, natural gas, water and chemicals while maintaining high production standards has driven innovative research and development initiatives at all company facilities. At our lumber operations, energy consumption is dictated by factors including log diameter, the speed at which logs are fed into the mill and the moisture content of wood. As a first step in reducing consumption, the Whitecourt sawmill consolidated its power supply with the adjacent pulp operation’s, drawing its electricity from the feed supplying the pulp mill in a move that reduced usage and costs by more than half. As well, both Whitecourt and Fox Creek sawmills have introduced energy-efficient technology such as variable frequency drives, motor capacitors and soft starts. 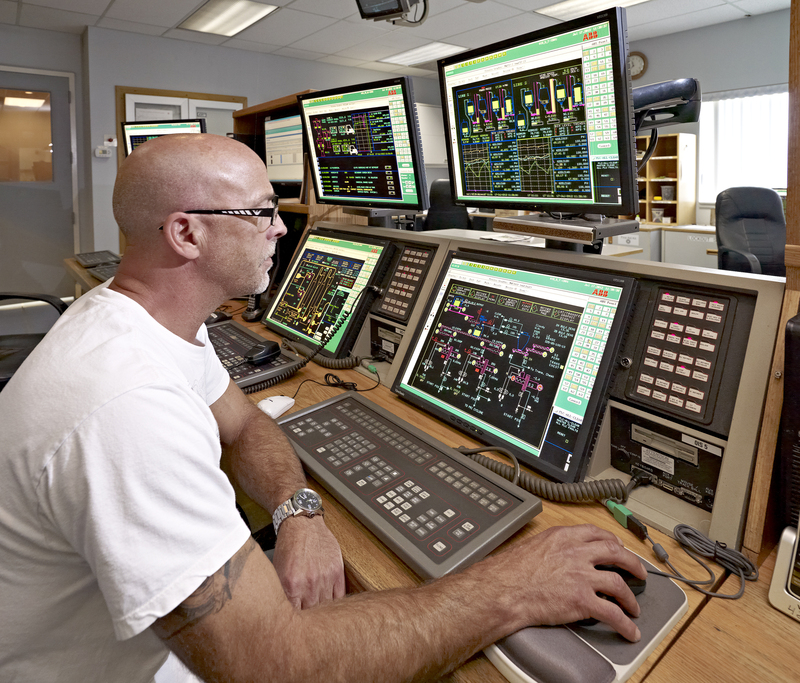 At the Whitecourt pulp mill, electricity reduction focused on the refining stage of the pulping process, which accounts for the majority of the mill’s overall energy requirements. By redesigning the refining plates, Millar Western was able to make significant cuts in its power consumption. As part of its overall energy-efficiency review, the pulp mill also undertook a full-mill energy balance study, leading to projects that have allowed the recovery of heat from mill processes that can be used for purposes such as heating water and make-up air, thus reducing natural gas usage. Building on the success of these and like initiatives, we continue to explore ways to further reduce input consumption, cost and environmental impacts. 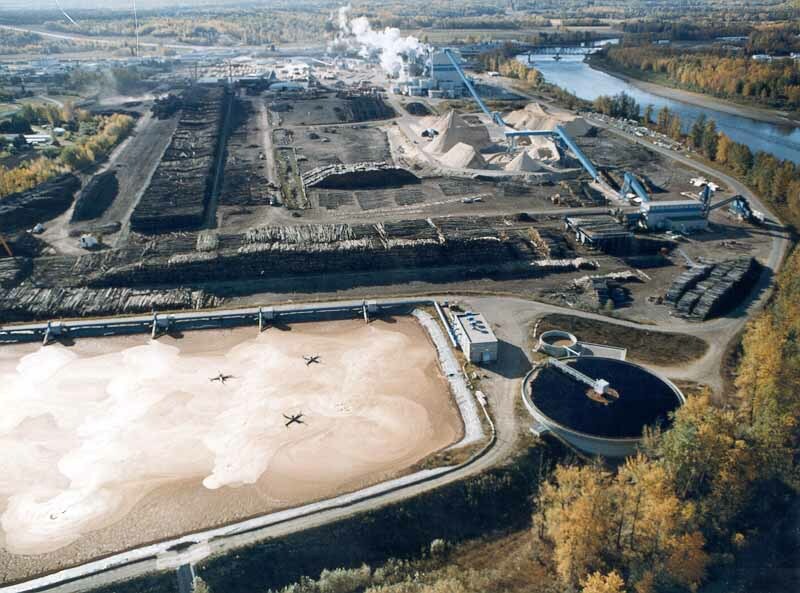 When it started operation in 1988, the Whitecourt pulp mill relied on an aerobic treatment system to clean its liquid effluent prior to discharge to the Athabasca River. The system performed exceptionally well, despite challenges posed by climate, frequent grade changes and climbing production rates. In 2013, the mill began looking at ways to convert waste streams to energy and initiated the Bioenergy Effluent Project (BEP). The project involved installation of an anaerobic pre-treatment stage that uses innovative anaerobic hybrid digester technology to generate biogas from organics in mill effluent. Once cleaned, the biogas is used to generate power and heat for mill use. The new two-stage system not only generates renewable energy and reduces reliance on fossil fuels, but it also significantly cuts greenhouse gas emissions, lowers water intake, improves the quality of effluent discharges, and decreases operating costs, reducing our environmental footprint while making us more competitive in global markets. 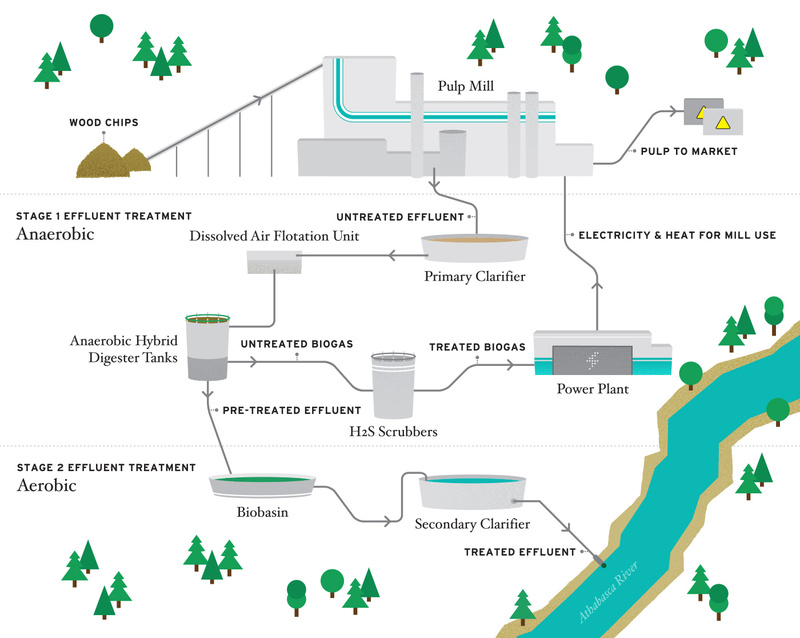 The pulp mill creates two streams of process waste-water, or effluent: trench (spills, overflows and washing) and white-water (hot-water and chemicals stream that carries pulp through the mill). These streams converge in the primary clarifier, for initial solids removal, then flow to the Dissolved Air Flotation (DAF) unit, for further extraction of suspended solids. In the anaerobic treatment stage, the effluent is pumped to one of three anaerobic hybrid digester (AHD) tanks The effluent is mixed with highly active anaerobic microorganisms, to generate a biogas that, once cleaned in the H2S Scrubber, will be directed to a power plant, to generate electricity for pulp mill use. Waste heat from the reciprocating engines will be captured to offset natural gas usage in pulp drying. From the AHD, pre-treated wastewater is transferred to the mill’s aerobic system, for a second stage of treatment. In the aerobic system, the mill works to create a fertile environment for bacteria, tightly controlling factors such as nutrients, oxygen, temperature and age. The pre-treated wastewater from the anaerobic system is mixed with aerobic bacteria that digest remaining soluble organic wood components. The effluent and bacteria mixture react for seven days in the biobasin, until the organic wood waste has been significantly digested. From the biobasin, the mixture is sent to a secondary clarifier, where biomass and treated water are separated. The treated water is discharged into the Athabasca River though a submerged diffuser that disperses it over a wide area within the river. Biomass from the secondary clarifier is mixed with waste fibre from the primary clarifier and pressed to remove water. After the addition of polymers to bind the solids, the biomass is pressed again, then shipped either to local farms to serve as a soil amendment additive or to a local power plant to fuel the generation of green electricity. 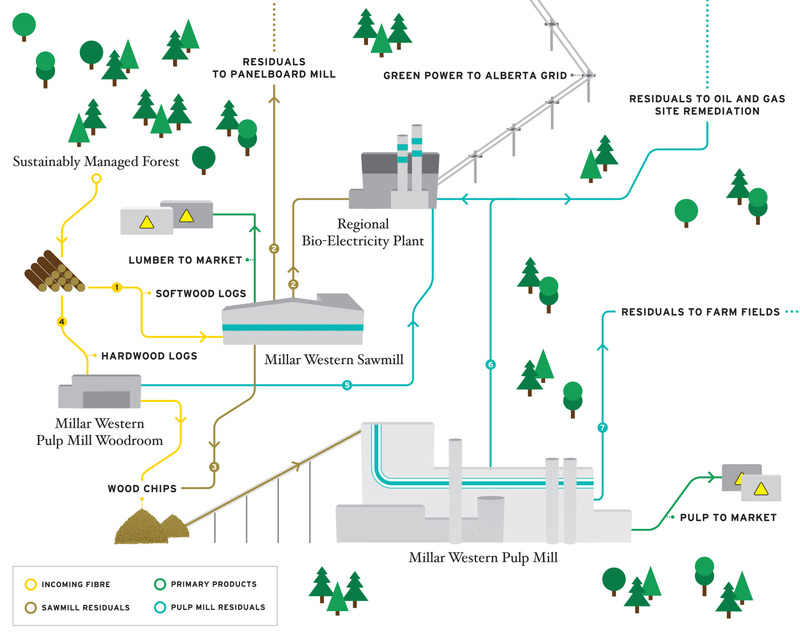 Alberta forest companies produce enough renewable energy from mill wastes to power four cities the size of Grande Prairie.